Hey. I'm extremely new to hobby grade RCs and the Traxxas Latrax Teton is my first truck. After quick a few runs, I've come upon issues with the steering servo. I've replaced the stock steering servo repeatedly and have even taken it to my local hobby shop for repair by the professionals. But nothing seems to work. I repeatedly strip the same gear in the steering servo. I've spent over 200 quid trying to repair this thing and just bought a new metal gear servo by Savox (The Savox SH-0255MG micro 1/18 steering servo). However, upon opening it then I've found that the gear that attaches to the steering horn is too small to work. Please help! I was looking for a hop up or even just a solution. What should I do? I'm willing to return to the stock servo if I can find a permanent fix for this issue. Use one of the steering horns it comes with. That's what I did. I just had to slightly modify it, but it works great! All I had to do is break the bottom part off and thread the pivot ball on. Doesn't need to be fancy. Just needs to run. Here's some advice from my personal experience, don't get aluminum suspension arms, upgrade to gtr shocks because the stock ones break easily https://www.amazon.com/Traxxas-7665-...xas+gtr+shocks Upgrade to steel axles, I've broken 4 aluminum before switching to https://www.amazon.com/Integy-Hop-up...NE43FW4PZ94H5T , get aluminum body mounts, get a motor fan, this is the one I use, you may have to bend the heatsink a little to make it fit, run 2s lipo, use the traxxas ones, put foam inserts into your tires. I don't use the 2s lipo for speed, but more run time. I'm running a hobbywing brushless quickrun system and it works great. If you have problems with diff housings, than get aluminum ones https://www.amazon.com/Integy-Hop-up...+rally+gearbox I know it's a bit pricey, but I put one in the front end of my car and it works great. Put sleeves on metal diff outdrives. I broke an outdrive when running without them. I just went to a Menards and bought some 5/16 in. brass sleeves and they work great If you have any questions, I'll be happy to assist. I've had my Sst for over 2 years and know everything about it. I know you have a Teton, but the sst is pretty much a Teton. Last edited by PecosBill; 10-07-2017 at 09:44 AM. When testing the fit of the servo itself, I noticed that the stock mount fit the servo but the screw holes did not line up with the holes in the stock chassis (this is caused by the Savox servo being a wee bit thicker than the stock one). Did your servo fit well or did you have to adjust it? I think that my servo (SH-0255) is slightly different from yours (SH-0261). I may need to drill some new mounting holes in the chassis, but otherwise I think the servo setup just needs a little work. Again, thanks so much for the advice and help. I will start working on implementing the upgrades you recommended right away! So managed to install my servo finally yesterday (had to wait a while to buy the bit for the dremel). My Savox servo, which was slightly different than the one you suggested, was thicker and slightly bigger than the original servo. I used the same bit you recommended and drilled new holes for the screws to hold the servo in place. After about an hour of running the thing yesterday and 45 minutes today than the servo has done a bang up job of staying intact and... well steering. It is quite a bit finicky and I have to have the steering trim to an absurd angle (I think 4 o clock) to stay straight, but it works. The steering draglink is unscrewed to its max reach to reach the horn and the left-right steering is inversed (probably because its a different servo). I've been looking up ways to re-calibrate the steering control of the ESC to fix the inversion of the steering but have had no luck so far. To say the least I had to wing it big time . (You're sign off is more true than you know ) Do you have any suggestions to streamline this or even just to fix the inversion of steering without having to unscrew and rescrew a bunch more or is that unavoidable? Savox and Traxxas teamed up and made a micro water proof metal gear servo a couple years ago. When my servo dies I’m going to get this Savox SW-0250MG, supposed to be a direct replacement and able to use the old steering horn. I read that the spline counts might be different but it drops in directly into 1/16 e revo which uses the same servo as in our Latrax... I think I need to look into it more. Last edited by jackislost; 11-27-2017 at 03:30 AM. Okay thanks. If my current servo doesn't work out long term then I will definitely need to pick that one up. I got a savox that is direct fit in Teton. It's strong and very fast and quiet. If the op sees this and wants the model I can find it for ya. Any body find a actual 21t horn that works? The only 21t horn's I've seen look to be a little to small on the end that the ball screws into. The 21t is for a savox or Corona not the stock. Would an MG90 servo work in place of the stock servo (TRA2065) ? and comparing specs between TRA2065 and MG90, both seem comparable in performance. The MG90 has additional height. MG90 is metal and way cheaper? Towerpro MG90 fits right in the servo mount its what I use in my Teton. You need to use one of the included servo horns of course. Drill a slightly smaller hole than 2.5mm and screw the ball head in. I use a flysky radio system though so I can adjust endpoints. Last edited by Igottabeme; 03-03-2018 at 11:37 AM. I accidentally ordered the other ^^ servo without re-checking this thread and it is indeed to large. Gonna hafta buy an e revo now lol. I really would like to know the model of your servo! ---------> Savox SH-0257MG works, just needed to trim the horn that came with it. I upgraded my servo to savox. Now when I give throttle or reverse nothing happens. When I steer left or right the wheels turn AND the motor accelerates. What do I need to do? You plugged the servo and the esc into channel 1. 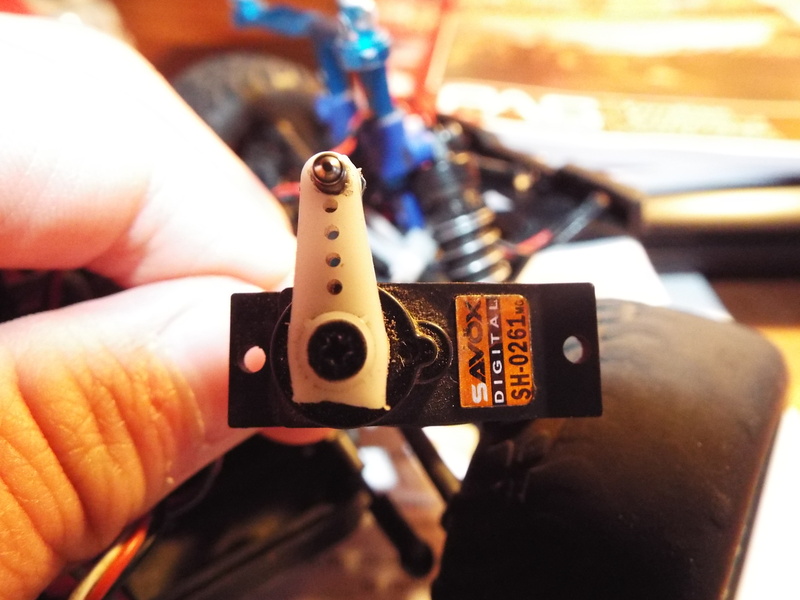 Remember, the traxxas reciever has two channel one ports. Unplug your esc and plug it in to channel two. Yep, that seemed to do the trick. I opened up my other Teton and put the plugs in the same channels. Thx! They are reversed from the stock traxxas ones. You’ll have to change the setting on your transmitter. Reverse the steering direction and all will be fine. It’s not an issue with the servo.